Baby massage has been practised all over the world since time began! I met Shannon and Darcy a few months ago and it was very apparent that Darcy couldn’t move his arm due to Erb’s Palsy. Shannon had a 13 hour labour and Darcy was born weighing 11lbs 6 oz without any warning of him being a big baby! Darcy’s head appeared first for a full 9 minutes before the rest of him arrived into this world..! The head midwife was called and she managed to deliver him but the initial thoughts were that his shoulder bone had been broken. When I met them both Darcy was 5 months old and a very happy baby. He was diagnosed with Erb’s Palsy very early on and his mother has been amazing at dealing with this and is diligent with doing any exercises she has been advised to do. 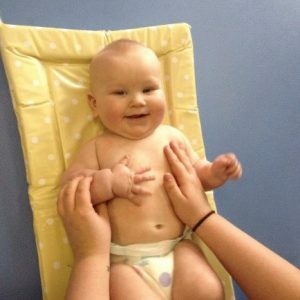 Shannon’s Health Visitor came to see Darcy last week and couldn’t believe the change in his arm in the month that he had been coming to baby massage! He hadn’t been able to lift up his arm beforehand but now can lift it up AND keep it up and she puts this down to baby massage! Baby massage has major health benefits to any baby but one of these is the strengthening of the nerves in the body. SO….what happens! There are thousands of fibres in each nerve cell and these fibres in the arm carry electrical messages from the brain to the muscle so that the muscle can work and move the arm. When a nerve is damaged the muscle that moves the arm may be weakened as the message is not getting to the brain. Massage therapy helps to relax muscle tissue so they are then able to get proper nutrients and so operate more efficiently. Gentle massage keeps the muscle strong and the joint from becoming contracted. Another reason baby massage helps with Erb’s Palsy is that when you massage your baby you activate your baby’s parasympathetic nervous system. This counteracts their negative response to stress, relaxes muscle tension and regulates the heart rate and blood pressure…Magic! It’s a bit like a chain reaction as it raises the Seratonin in the body and decreases the Cortisol. The classes have also been great for Shannon herself, as she says herself ‘It got me out of the house!’ She has made lots of new friends and is coming back to do the course again! It has been wonderful getting to know both Shannon and Darcy and her positive attitude is a joy to see and Darcy is just divine and has a very special place in my heart!